The Chapter talks about the importance of social media from the view of publicity for an organization. It talks about a few real life situations where organizations have suffered as a result of negative publicity on the social media. That negative publicity can be a disaster for the organization is emphasized. 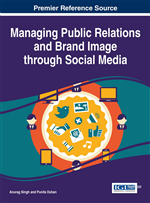 The chapter lists out the causes of negative publicity for an organization in the social media and how it can be tackled as is found in existing literature on negative publicity in the social media. The chapter ends with a series of guidelines to get back on track in the face of negative publicity in the social media. Social media is the new battleground for marketers. Every brand or business house worth its name is present in multiple social media platforms trying to engage the existing and would be customers in a meaningfully way. A study on Fortune 500 companies, conducted by university of Massachusetts Dartmouth Center for Marketing Research, reveals that in 2014, 413 companies (83%) of the Fortune 500 have corporate Twitter accounts with a tweet in the past thirty days while 401 companies (80%) of the Fortune 500 were on Facebook. As per Facebook’s 2014 Quarter 4 results, it had 890 million Daily Active Users (DAUs) and 1393 million Monthly Active Users (MAUs). These are phenomenal numbers. Social media is an excellent way to build relationships with customers and build word-of-mouth publicity. This is because social media provides the platform to engage in free or very cost effective public relations and promotional exercises. Social media tools allow publicists to interlock all the activities into a cohesive campaign (Burke, 2010). It is an amazing tool of free publicity that allows direct communication with the target audience without anything in between. From the customer’s perspective, social media is playing an increasingly important role as an information source. The role of social media in decision-making is an important one with the consumer sharing thoughts, concerns, and problems on a public forum for all to see, and feeling rewarded for it (Pollitt, 2014). The social media networks on their part also offer numerous benefits to the marketers to tap into their user base. Organizations have also gradually increased awareness regarding the importance of monitoring what their target audience says about them in the online environment (Mindruta, 2013). Identify the right social-media platform for our audience. Plan their content and frequency of updates. Build the page, create messages, or develop a following. Monitor the site for new followers and comments.